Clear the cards by making card combinations which have a combined value of 14 points. Select cards to make a combined value of 14 points. You’ll receive points for every side from which you have cleared a card. When you make a combination with cards from different sides then you’ll receive more points. You can also make a combination of 4 cards with the same value. Four kings, for example. 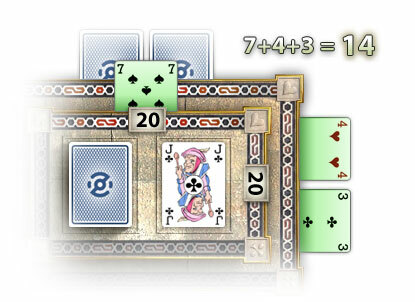 Each card represents the value as indicated by the number on the card, apart from the King, Queen and Jack which have a value of 13, 12 and 11 points. An Ace is worth 1 point. When you have made a combination with cards from the stairs, the underlying cards from these stairs will be revealed. You can make new card combinations with the revealed cards. You can also use cards from the deck to make a combination. When you have made a combination you will earn points for the sides from which you cleared a card. When you make a combination of 4 cards with the same value you will receive 40 points extra for every card. For each cleared side you’ll receive 400 points. 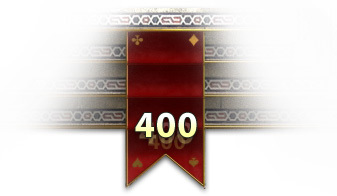 When you have cleared all cards from the stairs you’ll receive 100 points for every unopened card from the deck.